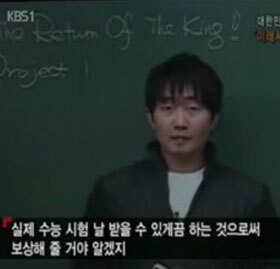 South Korean teacher Kim Ki-hoon has been making headlines for the past week, after The Wall Street Journal published an article titled The $4 Million Teacher on August 3rd. To be more accurate, I should say they published an essay by Amanda Ripley, adapted from her book The Smartest Kids in the World – and How They Got That Way. The book was slated to be released 10 days after the publication of the article in the WSJ. As you might expect, news outlets around the web pounced on the juicy headline, and it went viral pretty quickly. A teacher making $4 Million a year? Now that’s news, right? Political pundits were quick to jump on the opportunity to bash America’s education system, and discussions about the $4 Million teacher have been rife with controversy. First, I want to point out that the publication of the article itself is a great example of covert marketing. The essay, and it’s publication in the WSJ (which was perfectly timed to coincide with the book launch), was a great move on the part of Ms. Ripley and/or her publisher, Simon & Schuster. It shows how you can get millions of dollars of free publicity with a compelling article. We can learn a lot from this approach. The lazy marketer way is to do a press release announcing the upcoming publication of your new book. That might get you listed on a few newswire sites, but look how much more effective it is to create a well-written and compelling piece that has the potential to get people talking about it. Ms. Ripley took what (I imagine) is probably one of the most riveting examples from her book, and released it publicly in advance of the publication of her book. I’m not going to say much about the political side of the discussion, although it is certainly an interesting topic. I think Ms. Ripley’s exploration of the South Korean hagwon system, and the incentivization of teachers is worthy of consideration. At the same time, I think there are problems with using Mr. Kim’s $4 Million a year earnings as an argument to change America’s public education system. Those online lessons are part of a private business. Ms. Ripley is very explicit about this fact, yet in some of the subsequent “news” articles that were spun off of the original, readers would get the impression that Mr. Kim was making a $4 Million salary as a teacher. In other words, Mr. Kim is running an information marketing business! If the article had been titled “The $4 Million Information Marketing Business Owner,” it surely wouldn’t have gone viral. But there’s something about a teacher making $4 Million that really strikes a nerve. I’m not trying to minimize the fact that he is a teacher making $4 Million a year, but I think the “how” and “why” he’s making $4 Million a year have been muddied by the political agenda. In my opinion, the “how” he’s making $4 Million a year has a lot more to do with the fact that he’s running a business, and less to do with the fact that he’s a teacher. The “why” he’s making $4 Million a year has a lot more to do with the fact that he’s running a successful business than the fact that he’s working hard as a teacher, or the implication that South Korea values teachers more than America values them. This indicates that it’s not so much about how hard Mr. Kim is working, but about how he’s spending his time working. He’s spending the vast majority of his working time on things that actually leverage his time and reach. Furthermore, he is leveraging other people’s time by employing 30 others. At the risk of sounding self-aggrandizing, this is basically the same business model that I’ve been doing for the better part of the past decade, and teaching since 2007. Find something that people want to learn and are willing to pay for. Chances are good that you already possess such knowledge. Format the knowledge in the way your audience wants it, and package it in a way that can be distributed online. There’s nothing particularly new or inherently South Korean about this business model. It’s one of the most time-tested business models on the Internet, and entrepreneurs in myriad niches have been making millions of dollars selling information online for many years. On this point, I have to partially disagree. American entrepreneurs (and those in free market economies around the world) have been writing their own tickets for as long as the nation has existed. Many of these entrepreneurs have been able to make great money “doing what they love to do”; whether that’s cooking, writing, inventing, programming, and yes… teaching. Examples from our Internet marketing subculture are numerous. I could cite myself as an example, having made millions of dollars as a “teacher” in a niche in which I had no formal training. There’s the construction worker who now makes over $500k a year, the 19-year-old kid who makes millions selling ebooks, and the 83-year-old Grandma who created a profitable Ebay business while doing what she loves (shopping at thrift stores and garage sales). Then there’s the guy who sells over $10 Million a year of information teaching men how to date women. A fitness guy who does $1 Million a month teaching how to get 6-pack abs. And the information publishing company that does over $400 Million a year mostly from financial and health related newsletters. While those kind of statistics work great for sales letter headlines, they rarely make it into news headlines. After all, business people make money all the time, right? It takes something like a South Korean teacher making $4 Million (written about by a well-respected American scholar), or a couple of Stanford professors who are selling their courses online to over 160,000 students. While this business model has been around for a long time, what is changing is that it’s becoming more mainstream. Many institutions are moving their course offerings online, along with sites that host and curate higher level educational courses, such as Coursera and Udacity. Perhaps even more impactful is the explosion of do-it-yourself educational platforms, most notably Udemy. Unlike the higher-level education sites, which cater mostly to college students and feature courses taught by professors, sites like Udemy enable virtually anyone to teach virtually anything to anyone. This model of “teaching” is what I’ve been teaching how to do for years, but Udemy makes it easier for many would-be online teachers to get started. Instead of having to create your own website, and put the business together entirely on your own, you can essentially plug into Udemy’s platform. They handle many of the technical details like processing the payments, and hosting the course for you. In return, Udemy takes a cut of the course revenues (15-30%). Udemy recently issued a press release detailing the earnings of its top 10 instructors, who have earned a combined $5 Million+ on the platform to date. Of course this doesn’t include income that those instructors have earned outside of Udemy. Based on the relative newness of Udemy and its exponential growth rate, I expect they will have their own $4 Million teacher before too long. For those who are building an information marketing business, or thinking of starting one, I do still recommend creating your own website and building your own web presence and authority apart from any 3rd party platforms (for many reasons which are explained in my lessons). However, sites like Udemy are a great way to reach a wider audience with your product. For example, if you’re currently selling your product in one place (such as your own site), you could potentially multiply your earnings by reformatting and selling that same information on a variety of popular platforms such as Amazon Kindle and Udemy, as well as disseminating your information on free information platforms such as YouTube and other social sites, which can be monetized in various ways. In case you’re interested, here is a course that explains 10 places to market your information products, including Udemy. Very informative post, i have been telling anyone who would listem about udemy. Nice to see that you also recommend getting yourself on the site. I do think that for people offering services or coaching it is a must have, especially if you are coaching subjects like adsense and ppc. As always nice informative post. What I see here most of all is some very clever marketing. As internet marketers one of the ways we drive traffic is to write maybe one or, more probably, a series of articles to support a product or service. The real key to this one was that it was published in the Wall Street Journal. Very informative. Your interaction with (and not just duplication of or linking to) the WSJ article is both interesting and thoughtful. Appreciated. Thanks. Thanks Mr Eric,this is a good information that inspire me. Learning is a continuous process,the more you learn,the more knowledge you will gain. Please I have a question about Amazon s3,how can I host my digital product on Amazon s3 for people to download after purchased. Can we sell PLR/RR video courses over there. Thanks Eric. Great post. The gentleman in your article is a perfect example of, not making internet marketing more complicated than it is, which is what I think many, including myself, do. This guy knew what he wanted to do, and just did it. The last part, market it, is the hard part, but this is what i have been making more complicated than it really is. Hi Eric, I would like to contact you through your support section but the ericsupport.com website does not work. I know i can respect and value your opinion about internet marketing. A friend of mine is going to sell me on the idea of this new system. I am a newbie and i dont want to be suckered into anything that is going to be a waste of my money. please have a look at this when you can and express your opinion. Thank you. This is a friends referal link. My helpdesk should work, so let us know if you received any error. I checked out your friend’s link briefly, and it does not look like something I would personally recommend. It seems to be geared mainly toward people who are already involved in MLM/network marketing. Thank you for the great lessons! I joined Eric’s Tips on Saturday,8/17/13. and have learned a lot.I do have a few questions? Lesson #2 – I really do want to start and have successful online businesses; I have a strong sales/marketing background, but limited tech skills…you make it look all so easy,thank you for putting me at ease…is there a place that offers live classroom instruction on this stuff, in Seattle. I can’t seem to locate any? Lesson #3…”Stop Buying Stuff…” I have looked at your systems and your recommendations.Does this mean that I should not buy any stuff, including your systems, until I have completed the 100 lessons? At the moment, I am particularly interested in the “PUSH BUTTON MARKETER” “HOW TO HAVE TOUR OWN (informational) PRODUCT IN 30 DAYS” and also “NICHE10X). The 18 different ways to market online, wow! — I believe that I can do reasonably well using 4 different ways – Affiliate Marketing, MLM, My Own Informational Products, and E-Commerce. I have some experience in each of these areas, but I have mostly helped other companies do sales offline, and now want to go out on my own, but online. Would I start all four of these projects at once, having them intertwined or do one business at a time. I have a large solid vision where I want to take my online businesses, but the reality is, I have limited tech skills. I welcome your thoughts and recommendations. Thank you so much! Fabulous post about the teacher…it is very inspiring! BLESSINGS, BLESSINGS AND MORE BLESSINGS! #2- I really don’t know. I’m sure there are some college Internet marketing classes, but not sure if they would teach hands on how to build a business like I do. You may be able to find a weekend workshop somewhere, but beware as most internet marketing seminars are designed to sell you stuff. #3- The rule is this… stop buying stuff unless you know why you’re buying it and how you’re going to use it. So that’s really up to you. For example, push button marketer is a tool that can save you time for all kinds of tasks on your computer (regardless of whether you’re using it for marketing), so I think it’s a great value. But it’s only worth it if you actually use it. The infoproduct ebook is probably not necessary if you’re following all my lessons. The niche 10X is mainly geared toward anyone who already has some existing product or content to monetize (by showing how to sell it 10 different ways). #4- No I would not recommend starting 4 projects at once, as it’s a recipe for disaster 😉 Best to choose just 1 business model to pursue, until you either succeed or fail at it. Then you can add another one (if you succeeded at the first one), or try another one (if you failed at the first one). Hi, Eric–very informative and inspirational article, thank you for posting it. Also, I want to mention to you that I appreciate the consistently high quality of your writing! Unlike so many people, you are easy to follow, grammatically correct, and organized. Please keep up the good work! Thanks very much for all of your good sound advice and support. I’m taking it! All classes are book-based to my knowledge. I have attended several Internet Marketing Seminars…Whew! I purchased items from two separate seminars, both promising me the moon, well, I didn’t even make it amongst the stars:)! I will go ahead and follow your Lessons and would eventually like to use your Coaching Services; I plan to start with Affiliate Marketing and go from there… I currently work in the real estate business, which has been very kind to me over the years…even though it has been slower than normal for a bit, it is starting to move again. Real Estate is becoming more and more tech inclined, so I have learned pretty well; however, Internet Marketing is a much more sophisticated/savvy technology; but I am up for the challenge to learn it successfully! MY QUESTION: When it comes down to being successful or unsuccessful with internet marketing, where do you draw the line? What I mean is, if I am able to support myself with Affiliate Marketing, then this is considered successful? If I work hard and smart, on average, what time frame to do most people begin to excel in this business? Lesson: #5 There are a lot of scams in Internet Marketing and Real Estate too. I do a lot of research on everything now, but even some of the “Reviews” are untruthful…so if I see something that I think may be good, can I ask your opinion (pros/cons) before I purchase it? Sometimes, as a newbie, I can easily misinterpret stuff, even if I think I know what it does or is suppose to do, it is often confusing. I’ve looked at your Recommendations Page on Eric’s Tips. Thanks so much! That lesson should be helpful to you, in deciding where to draw lines as you invest your time into your online business. Thanks so much, #18 was sooooooooooooo helpful. I am certainly ready to start my Affiliate Marketing business successfully, leaving my current job behind! I look forward to the many Lessons…learning is where success begins! Inspiring story which got a massive attention from the online media. One good motivating article which gave me and my team at ClickDo to put more time in creating information products targeting students. There is koocam.com! a perfect site for those who wants to work from home by selling their knowledge about anything.